Dinosaurs Will Die and Snowboy Productions presents the return of BARRELy AN EVENT! 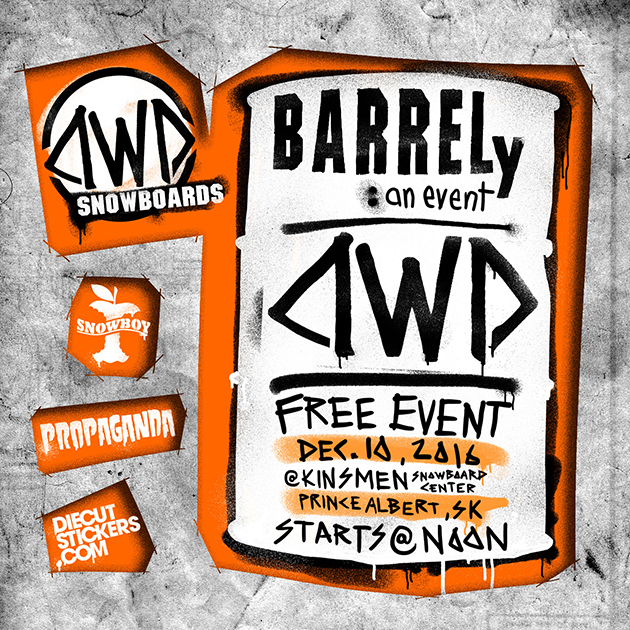 This year it’s going down with our good friends from Propaganda on Saturday, December 10 at Kinsmen Ski and Snowboard Center in Prince Albert, Saskatchewan! BARRELy an Event is a simple, stripped down, creative, and bullsh*t free way to celebrate the start of another great winter with all your friends. We’ve got 12 barrels, a bbq full of hot dogs and unlimited possibilities just waiting for you and the DWD team to jib, bonk, race, jump, eat, drink, laugh, fall and high-5 all day long. Event kicks off at the crack of noon and ends some time later…no entry fee and free hot dog lunch…under 18 needs a parents signature on the release. Big ups to Adam at Propaganda and the crew at Diecutstickers.com for all the support…take care of those who take care of you!